This is a brand new, fully-licensed, 24" X 36" poster of the cover art for comic book issue #53 of The Avengers entitled The Avengers vs. The X-Men. 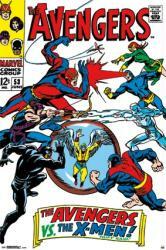 The poster's image is taken from the 1968 Marvel Comics issue featuring the cover art of John Buscema.